Turkey recalls its Vatican ambassador after Pope Francis uses the word “genocide” to describe killings of Armenian Christians under Ottoman rule in WW1. Armenia’s efforts to promote greater awareness of the massacre of 1.5 million of its people by Turkey during the fall of the Ottoman empire were given a dramatic boost on Sunday by the pope’s description of the atrocities as “the first genocide of the 20th century” – days ahead of the centenary of the event. 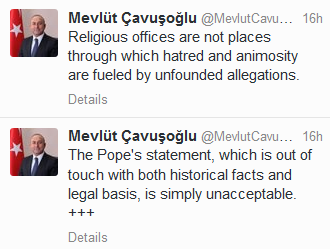 Turkey’s ambassador to the Vatican, Mehmet Paçacı returned to Ankara late April 12, after Ankara’s strong reaction against Pope Francis’ description of the mass killings of Armenians at the hands of the Ottoman Empire as genocide. In speaking of the World War I-era slaughter of Armenians, the pontiff upset officials in Turkey, which has argued that a large number of Turks were also killed during that period. The remarks ignited a diplomatic confrontation with Turkey, which quickly summoned the Vatican’s ambassador to condemn the pontiff’s remarks.